Keriya Nameless lives in a world where she constantly feels boxed in – there’s so much she wants to do, but very little that she is able allowed to do. And so, on the eve of the Ceremony of Choice, Keriya forces the elder’s hand and secures herself a spot. She races off into the forest with the rest of her age group, bound and determined to survive the trials and bring back glory. Turns out that the villiage gods are real, and Shivnath, the dragon goddess, takes notice of young Keriya. And Keriya, while young and naive is not that young and naive. And so, she is told the story of Necrover – a terrible man who is ready to sweep his great evil across the land once more – and that she (Keriya) (the Nameless) (the Magicless) is a Dragon Speaker. She doesn’t have a dragon. With little more than a whisper and a prayer, Keriya sets off (technically, she’s chased out by her torch-and-pitchfork armed villages) – after all , if someone has to save the world, it might as well be her. He sensed something terrible and foul, something far worse than anything they had yet encountered. Keriya was in mortal danger. In short – yes! Yes! Yes! Yes! The world, Allentria, was fairly well-done. 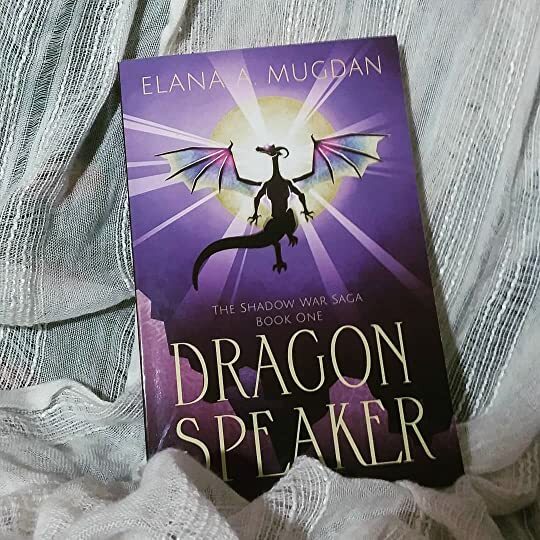 I particularly enjoyed the magic system – it had a slightly Avatar (the last Airbender) feel with the elemental magic but Dragon Speaker was unique enough to stand on its own. The characters were well done – which can be difficult given the sheer number of them! I absolutely loved the slightly-bumbling-and-definitely-foul-mouthed secondary characters – how can you not smile when you come upon quotes like this?! And (of course) my favorite character was the dragon, Thorion. I am an absolute sucker for any book that has a dragon in it, and this one did not disappoint. Dragons (in this world) are emotionless and apathetically cruel unless they bond with a person (and are thus humanized). Thorion, even in his cruelest and wildest state, had such a hilarious deadpan that I spent much of my time wishing he had more page space. Wisdom dictates that it is inadvisable to deal with humans. Though, to be fair, the entire book’s sense of humor was really on point. Whoever decorated this place had really nailed the ‘imminent doom’ motif. I had a blast reading this – it was refreshing and fun. I cannot wait to see what the author writes next!